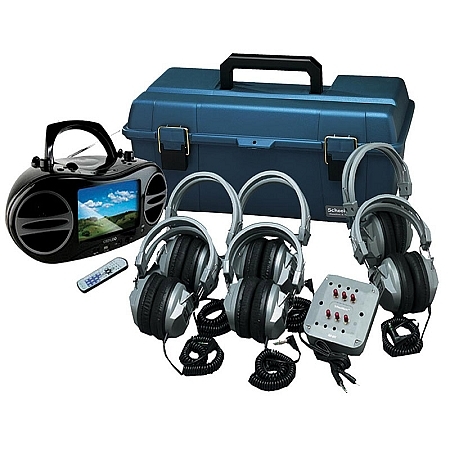 The Hamilton Sound Vision Listening Center has everything you need for classroom audio and video for up to 6 students at a time. Give your students access to great educational content on most popular formats including DVD, CD, MP3 and more. Hamilton Electronics presents the Sound Vision Portable Video Boombox Movie & Music System. Featuring a 7" LCD Display for Movie Playback, the Hamilton Sound Vision Plays DVD, CD, CDR/RW and CD-G Karaoke disks. The built-in USB memory reader also lets the Sound Vision read JPEG, MP3 and MPEG-4 files. There’s even an. AM/FM radio! Even with all its advanced features, the Sound Vision is easy to use. DVD and CD playback can be done with the controls directly on the boombox. Additional features and menus are accessed using the included remote control. • Plays DVD, CD, CD-R/RW, and JPEG discs? The Hamilton SC7V Headphone with individual volume control features four-in-one operation on 1/8 inch stereo, 1/8 inch mono, 1/4 in stereo and 1/4 inch mono modes. New soft leatherette style washable, replaceable ear cushions, new easier-to-wear lighter design with swivel ear-cups and soft coil, 3 meter long coiled cord (almost 10 feet!) all contribute to longer fatigue-free use. Now in easy to mark medium gray colors. Use in groups with a listening center jackbox. • One (1) year warranty. Copyright Curtis Company. All Rights Reserved. eCommerce Software by 3dcart.